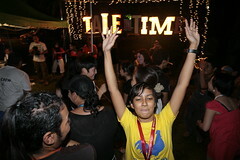 On the night of August 29th, our 3rd Assistant Director Sharifah Amani stood on a chair and announced, "It's a wrap!" After nearly 2 months of intense rehearsals, principal shooting began on August 17th. We had a 1 day break in the middle, so that makes it 12 days of shooting for "Talentime", just like "Sepet", "Mukhsin", and "Muallaf" before it. Honestly, this was not something we planned. 12 days was all we needed, alhamdulillah, and if you had given us extra days to play around with, we wouldn't have known what to do with them. Nani's announcement was greeted with wild applause and cheering, of course. People started shaking hands and hugging, and that's when the tears began. This was a bunch of 60 to 70 people who had been having breakfast-lunch-tea-dinner-supper together for 3 weeks. We had toiled together, slept together (separate rooms for boys and girls, of course, but all next door to each other). We had laughed together, and cried together. These weren't co-workers or colleagues anymore, this group of people had become a FAMILY. Everyone was relieved that all that hard work was finally over, but no one wanted to say goodbye. Men and women, boys and girls, we were all teary-eyed. Some of the younger actors were sobbing convulsively. I was halfway through comforting the tearful lady who played Melur's grandmother, when the kids came up to me and said, "Mak, you'd better come and attend to Kahoe (the boy who plays the erhu), cos he can't stop crying." We were also lucky to have in our cast that outrageously talented singer who goes by the name of Jaclyn Victor. 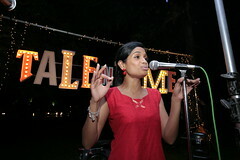 Jac (or Bhavani, as we call her on set) just took to the microphone and sang her heart out. What a treat! When Jac started singing "I will always love you", there was a lump in everyone's throat and even some outsiders dropped by to have a listen. It started to drizzle, but we didn't care. As far as we were concerned, rain is God's blessing, so in the end people just came out from under the shelter of the tents and started dancing in the rain. But I must say, the most moving moment of the evening for me happened a few minutes before Nani's announcement. It happened when our special guest Ustaz went to the front and said a prayer of thanks on our behalf. While holding the palms of my hands up to say "Ameen", I surveyed the area to look at my big new-found family and saw that the folks of other races were also holding their hands up and saying "Amen". There was so much love and so much trust there that everyone automatically assumed that the prayer, although in Arabic and not understood by all, was a good prayer that could only ask for good things for us all. It was a moment so overwhelmingly powerful for me that the hair on the back of neck stood on end and the tears were unstoppable. Allah is generous beyond our comprehension. 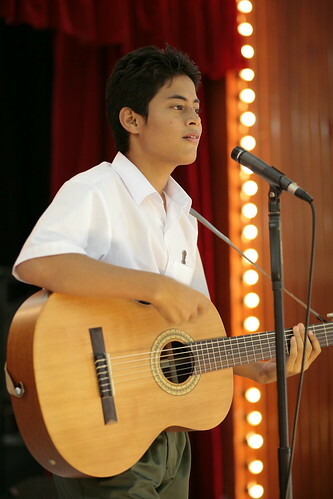 The boy who plays the guitar. The boy who plays the erhu. The youngest sister's name is Melati. Three sisters and a father. Two stars and the moon. "Mahesh look," she said, pointing to the night sky. "Because I'm lonely, the night sticks her tongue out at me... half moon." The scene that left us all solemn and quiet. At the end of a heartbreaking scene in the film, a Hindi song by Rahat Fateh Ali Khan is heard. The words say, "It feels like I've been raised by strangers... please take me into your world..."
The song ends on a 12-year old Indian girl dancing like an angel on stage. Our hair stood on end as we filmed her floating across the floor, in moves that spelled deep love and heartache. We're off to shoot a movie! Tomorrow, inshaallah I'll be flying to Bali to judge for the Indonesian advertising awards. I'll only be there one night though, because the very next day, on Wednesday evening, I'm scheduled to fly back to KL. Why? 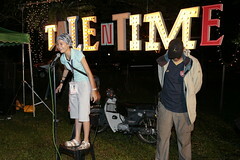 Because on Thursday, my entire production crew and I will be heading for Ipoh to make "Talentime", inshaallah. We plan to rehearse our actors at three different locations before principal shooting starts on Sunday. Wish us luck, and assalaamualaikum! I just came out of "Susuk". To me, in it's barest form, "Susuk" is the story of people who would stop at nothing to get to the top, and having reached it, refuse to come down. I'm not saying it's a political satire; I'm saying it's a satire on those most destructive of human foibles: greed and vanity. What a relief to watch a Malay horror film that despite not taking itself too seriously, was seriously spooky in parts. This, as opposed to many Asian horror flicks, local or otherwise, that DO take themselves seriously, but leave me guffawing inside. I won't say if "Susuk" is a good film or not (because I don't know what a good film is, and I prefer to leave such solemn foolery to some of the local critics), but what I CAN say is that I liked it very much. The kitsch art direction that was bursting with its makers' wicked sense of humour; the homage to Argento, Almodovar, Lon Chaney and Bela Lugosi; the shameless but totally knowing and tongue-in-cheek borrowing of images from "The Godfather", "Hellraiser", and countless others... all this led to a thoroughly enjoyable movie experience for me. Walking out of the cinema hall, I felt a strange sense of relief. "How lovely," I thought, "to watch a local film made by genuinely smart filmmakers who didn't have their heads up their own arses, and who seemed to have fun playing with film."